This taco supper is fast and really good. Shred the meat from a store-bought rotisserie chicken. 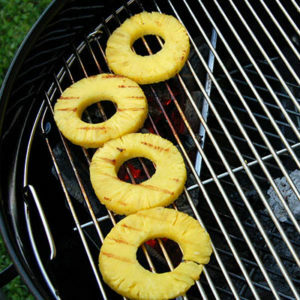 Grill fresh pineapple and onion slices until they’re brown. Slice an avocado. Then, fill your taco shells with chicken, avocado, grilled pineapple, and chopped fresh cilantro. Give everyone a slice of fresh lime. It’s the grilled pineapple that makes the gang happy.